Mobility Inc is dedicated towards improving the mobility of every individual through the use of durable medical equipment, mobility products and mobility equipment. Posted on July 21, 2010 by John N.
If an active person with mobility impairment is committed to maintaining long term independence, a power wheelchair might be a wise investment. However, individual needs may vary, and this is a purchase that should be considered carefully. Rehabilitation specialists can help by guiding customers through the process of selecting the ideal equipment for each user. There are many resources for independent research about electric wheelchairs. They are especially helpful for people with limited upper-body strength and impaired balance. Research of internet ratings, telephone consults, in-home visits, and brochures can also help consumers make an informed choice. Use of a mobility chair in the home can enhance the patient’s quality of life and allow him or her to maintain long-term independence. The option of completing some activities of daily living in a seated position can minimize pain and conserve energy. Chairs are constructed and custom made for optimum practicality. Custom seating enables proper posture and maximum comfort. A wide variety of models are available. Compact models allow easy access through doorways, halls, flooring of various textures thresholds, and rooms. Home use of a mobility wheelchair can be workable even if the home has no other special accommodations like ramps or lifts. ADA requirements of wheelchairs requires areas around the home such as entrances, hallways or rooms must have at least 32-36 inches of free space and a wider turning radius of 5ft. Service of an in-home wheelchair is convenient as well. In fact, most users will never need to leave the home in order to maintain and repair their equipment. Most merchants also deliver loaner chairs to the home while repairs are completed. Use of battery operated wheelchairs can also allow users to participate in more community activities. Less pain and more energy equals more time for pleasurable activities. The Americans with Disabilities Act ensures wheelchair users the right to unimpeded access to all buildings and additions constructed after 1994. Discrimination against disabled individuals is outlawed. 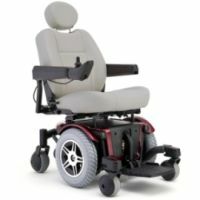 While this investment requires careful consideration, use of an electric mobility wheelchair in the home or community could be just the right choice. Qualify for a mobility wheelchair with a quick sign up. Mobility Inc is dedicated towards improving the mobility of every individual through the use of durable medical equipment, mobility products and mobility equipment. Our goal is to help those with mobility issues, regain and restore their independence, privacy and dignity. In addition, by doing so, the lives of caregivers and loved ones who aid the handicapped individual can be made easier. New mobility products get on the market every day and the consumer has to be informed about these high quality products. Without proper mobility information, mobility disabled individuals find they are improvising with equipment that are not suitable for the job. This leads to dangerous scenarios where the individual's life is compromised. Learn about quality and valuable mobility assistance devices for your own benefit.